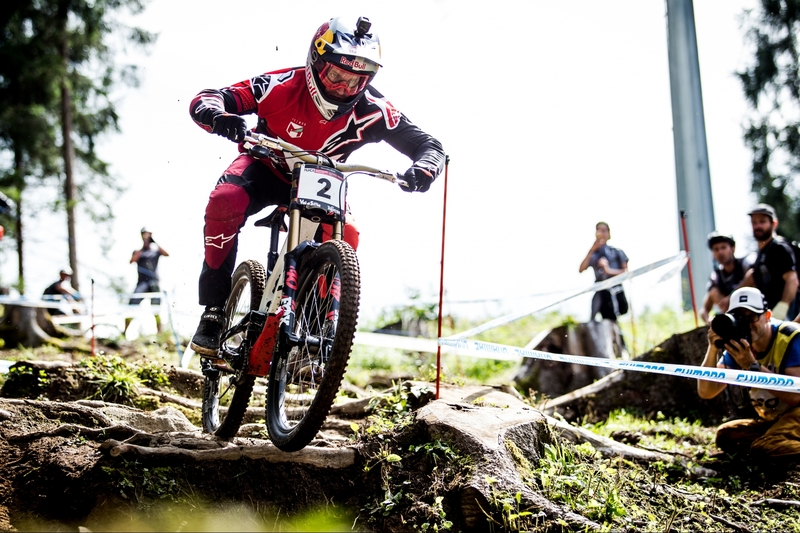 After just rolling out of the start house yesterday in qualifying and not completing his run, it was clear that the slide out crash which reinjured Aaron’s thumb was going to be the question mark over the 5 Time World Cup Champion coming into today’s race. After getting some training runs in today Aaron decided to give it a go and do what he could to stem the point loss. Impressively he finished 31st today after man handling the bike down the steepest and most technical track of the season, using his legs in places to press against the frame and relieve the pain and pressure from the thumb, it was a champion’s ride, and he now sits in 4th place overall, just 10 points from 2nd. The original injury, which occurred in his race run at round 2 in Fort William, is essentially a thumb that was dislocated and has localized damage all the supportive tendons, muscles and so forth. The healing process has been slower that Aaron would have liked, but he was optimistic of being able to give Val Di Sole a solid hit out, that was until a simple practice slide out crash on Friday before qualifying, which jacked it up all over again. 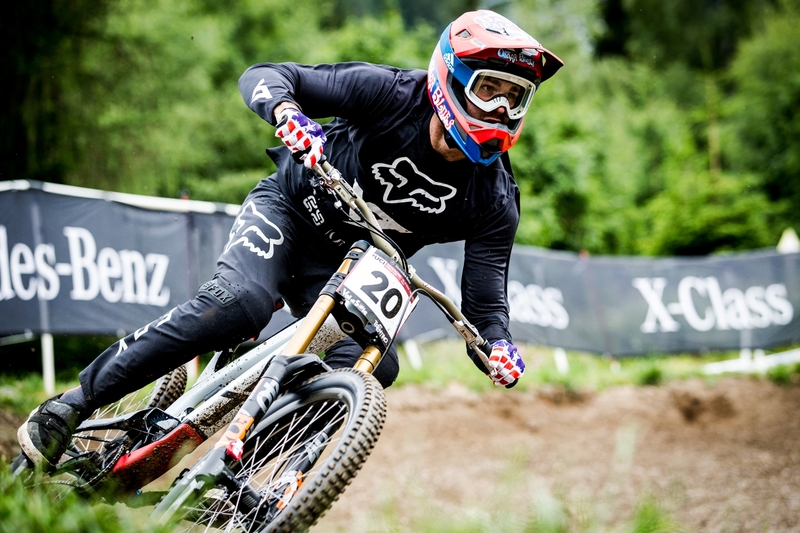 Team mate Neko Mulally also suffered a training crash, which many riders experienced due to the track in Val Di Sole being wet for the first time in many a year. The knee injury and not having protected status meant that Neko took a steady run down the hill in qualifying, finishing 36th but today he turned the wick up and scored a solid top 20. 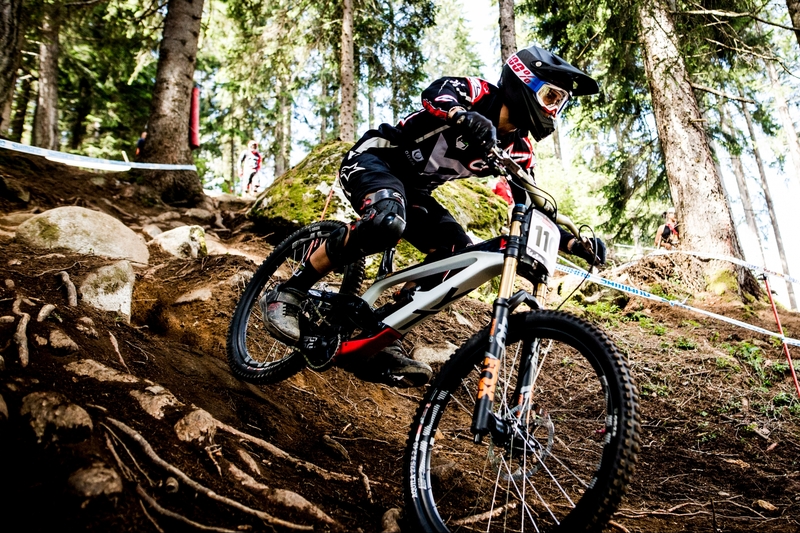 Val Di Sole is one of my favorite tracks on the circuit and I was really excited for it this weekend. I finished 18th today and that’s always a solid result but it came with a lot of challenges. I twisted my knee in a practice crash which had me feeling pretty weak and I ended up having to ride with an MX knee brace. In my finals run today I lost a lot of time at the bottom of the track having to compensate for the lack of strength in my leg by using my upper body more, and I also had a hard time pedaling with the knee brace. I’m bummed to drop back after being in the mix half way through the race; I always want to be one of the stronger guys but I went out on track with everything I had and held on as long as I could. I can be happy with the speed I showed and for Andorra next week I think I’ll be feeling back to normal on a very similar track. Young talent team mate Angel Suarez was once again plagued by a mechanical that affected his qualifying race run, causing him to crash three times. Despite this, his last sector was the fastest of the entire field, except for race winner Amaury Pierron. Angel has the speed in spades but is lacking the luck. The team will do everything it can to help him turn that around for Andorra next week.